Convert your young ones to greens with this inventive dish. Rinse the brown rice in cold running water. Drain, place in a pot and cover with cold water and soy sauce. Bring to the boil, then simmer for 30 minutes or until tender and nutty. Drain through a sieve, then return the sieve to the pan off the heat, covered with the lid to keep warm. Cut the Chinese greens on the diagonal into bite-sized lengths. Heat the oil in a wok and, when hot, stir-fry the garlic and ginger for 1 minute. Add the greens, tossing well for 1 minute. Add the cherry tomatoes, chilli bean sauce and stock and toss well for 2 or 3 minutes or until the gai laan is just tender and the tomatoes are soft. 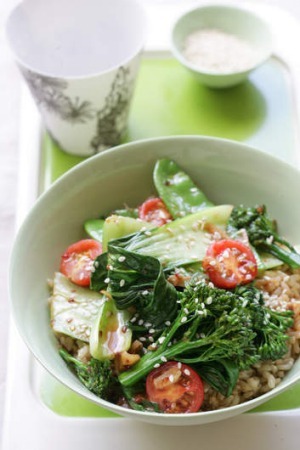 Serve with the rice and scatter with sesame seeds.